The day after Christmas: rain, cleaning up all done, children melting down, boredom, no hot water for a cathartic shower (again! really! what’s up with that?)…. For the fifth time today, Jack whined, “Mommy, I’m hungry.” I looked around the kitchen—not much there. Then I remembered the orange trees. Let’s go pick an orange to eat! Jack was ready for any kind of outing, so we put on our rain boots and rain coats and hoods, and walked out to the tree, which, from a distance, seemed to have no more fruit. But when we got up close, and I crouched down to Jack’s height, I saw the clusters of ripening, reddening Tarocco oranges—the common Italian variety of what we call “blood orange.” The pulp is not as red as that of its Spanish cousin, Sanguinello, and the fruit not as large as the most common variety in the U.S., Navel. 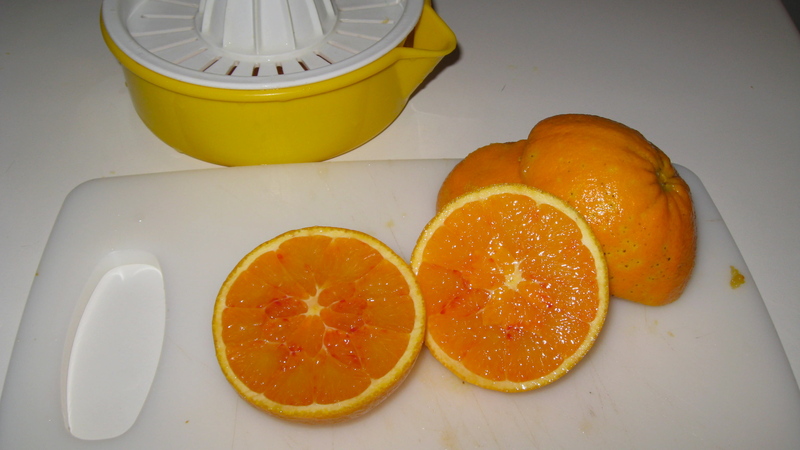 Threads of read are shot through the center of the deep orange fruit, and the juice is deliciously sweet. Because of the structure, with little mini-sections in the center, I decided to juice it instead of peeling it and parting it and wasting the juice in the process. Jack guzzled a cupful in seconds. And then, within seconds, he was gone, having just received an invitation shouted up through the open window from the driveway below to come down to Lulu’s for hot cocoa. 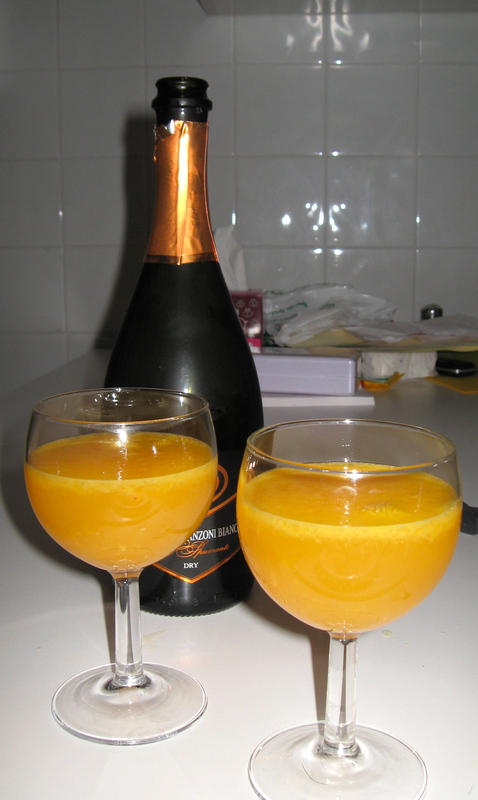 I juiced the other orange we’d picked, poured it into wine glasses, and topped it off with the prosecco left in the fridge. Wow! You may remember my post on fruit/sparkling wine cocktails. Now there’s a new one to add, and I’ll have to say, it definitely wins out over the Puccini and the Mimosa. That is such a beautiful, simple way of keeping a young child entertained! Sometimes I forget how much fun can be had venturing outside in the rain too – especially doing something like picking fruit! Thank you for your blog. I love reading about those food related issues that affect all of us and being able to compare it to things here in Australia. The Italian twist fulfils the “wishing I was somewhere more exotic” part of me!